Off the Hanger suffered major damage during the Friday night fire. Firefighters from Woodbury and several surrounding communities managed to extinguish a fire that endangered the south side of the Square. Extensively damaged were Faith and Hope's Consignment store, the apparent starting point of the fire. "We believe, at this point, that it was electrical in origin," said Woodbury Fire Chief Bill Johnston. 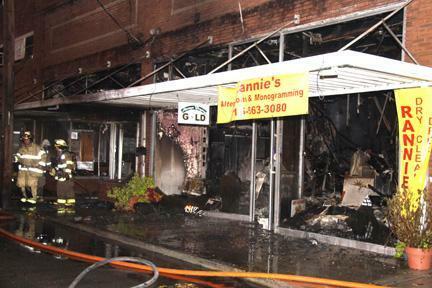 Also heavily damaged was Off The Hanger, a shop that was also home to Rannie's Alterations and Always Buying Gold. Store owners and volunteers managed to save the contents of the Bean Patch and Tangles Salon, which sustained some damage. Fire fighters pushed back spectators at one point fearing possible flammable chemicals in the hair salon. Besides Woodbury's Fire Department, units from across Cannon County responded to the blaze as did units from Rutherford County. A massive "snorkle" fire truck from Manchester helped bring the blaze under control.